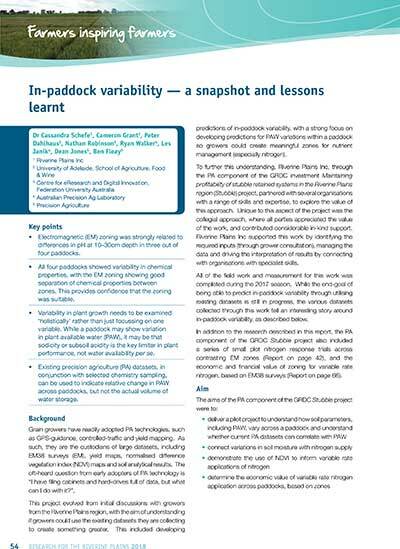 This study is examining in-paddock variability in the physical and chemical properties of soil for suitable plant growth. The research uses precision agriculture datasets to unlock new insights about plant performance in varying soil conditions. Grain growers have readily adopted precision agriculture technologies including GPS-guidance, controlled-traffic and yield mapping. Consequently they have become the custodians of large data sets but with only minimal opportunity for utilising the data for themselves or with other growers. This project was developed following discussions with growers in the Riverine Plains region to understand if growers could use their existing datasets to predict in-paddock variability based on data for plant available water (PAW). This could enable growers to develop meaningful zones within their paddocks for nutrient management. The project involved collaboration between CeRDI, the University of Adelaide, the Australian Precision Ag Laboratory and Precision Agriculture. Together they conducted research to further understand the precision agriculture component by ‘Maintaining profitability of stubble retained systems in the Riverine Plains (Stubble)’ project. The project was funded by the Grains Research and Development Corporation. Determine the economic value of variable rate nitrogen application across paddock, based on zone. Four paddocks in the Riverine Plains were included in this research. Paddocks were located in Howlong (canola), Rutherglen (wheat), Telford (wheat) and Yabba South (wheat). Sampling and subsampling were used across each paddock, including extensive incremental soil sampling and PAW samples. Datasets were collated, aligned and interpolated for layer data in a web-based mapping that would assist with data interrogation and assessment of relationships. The extensive field sampling utilised in this project assisted in better understanding the zoning for soil nutrient properties, and PAW, across different paddocks. The research findings show a clear delineation of soil chemical properties between zones with significant differences evident across a range of properties. The PAW measurements show a link between the soil chemical parameters and effective water uptake: in some instances, soil chemical parameters acted as a barrier, restricting plant uptake. The use of GPS located sampling points were an integral feature of this project. The spatial datasets collected from the same location within paddocks minimised spatial variance. GPS-assisted sampling also ensures that sampling points can be revisited in the future to further assess change in soil and PAW, over time. Grain growers have readily adopted PA technologies, such as GPS-guidance, controlled-traffic and yield mapping. As such, they are the custodians of large datasets, including EM38 surveys (EM), yield maps, normalised difference vegetation index (NOVI) maps and soil analytical results. The oft-heard question from early adopters of PA technology is "I have filing cabinets and hard-drives full of data, but what can I do with it?"